One of our most anticipated Nintendo 3DS games this year, Persona Q: Shadows of the Labyrinth, launched in Japan this past week. Lucky jerks! Unfortunately, Nintendo pulled a fast one on all of us and decided to make the 3DS region locked. Otherwise, I'd be bashing through the first-person dungeon crawler as we speak. What's that? Buy a Japanese Nintendo 3DS? Don't tempt me, man! 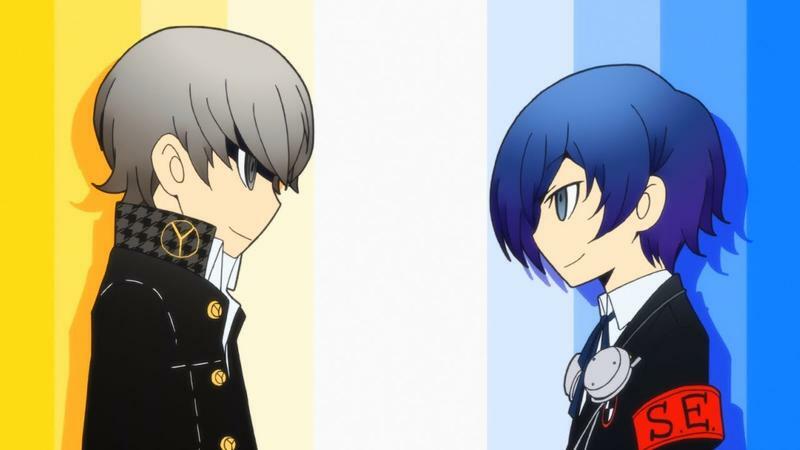 Persona Q: Shadows of the Labyrinth is a fan-service mash-up of the popular cast of characters from the JRPGs Persona 3 and Persona 4, tackled by the team responsible for Atlus' other great yet lesser known franchise, Etrian Odyssey. I'm not going out too far on a limb here if I say that even if I wasn't a fan of this holy triage from Atlus, I'd still be highly anticipating this title. The game's opening cinematic should hold the key to the reasons why. Just watch it. So much color, such slick character design, and of course, that's one amazing Engrish style J-Pop song to get the ball rolling. This is a game just begging to be played by anyone with a soul and a beating heart. Here are my predictions on the game. It's not going to be as deep of an RPG as Persona 3 or Persona 4. It's going to barely scrape across the surface of the series' traditional mechanics like demon fusing, dungeon crawling, and elemental weaknesses. At the same time, it's not going to be the same blisteringly difficult experience that the Etrian Odyssey games provide. Atlus doesn't want to scare away the uninitiated. Instead, this is just going to be a light fanfare of these two crews of demon hunters interacting with one another for the first time. I won't be expecting anything deep or memorable from it, just a whole lot of wild fun. We have a release confirmed for America, but there is no official date set. Atlus has said that it is aiming for the fall, so keep you fingers crossed for Persona Q: Shadows of Labyrinth on the Nintendo 3DS until then.